On occasion I have to really dig deep to come up with something to make for dinner. I have to think outside of the box and get creative. Tuesday night was one of those nights and I am so glad that everything came together so well. On Monday I had made meat pies (recipe here). The batch of dough I made was more than the meat filling I had and so I saved it. I had no idea of what I would use it for, but in the fridge it went. Oh, and by the way...the meat pies are killer too! Especially with the onion gravy...Great, now I am hungry. Anyways, Tuesday night I head to the fridge and pull out the dough. I had also taken and thawed two chicken breast. I could have easily made Chicken Pot Pie, but honestly, I don't much care for this dish. Then I saw it...the cream cheese! 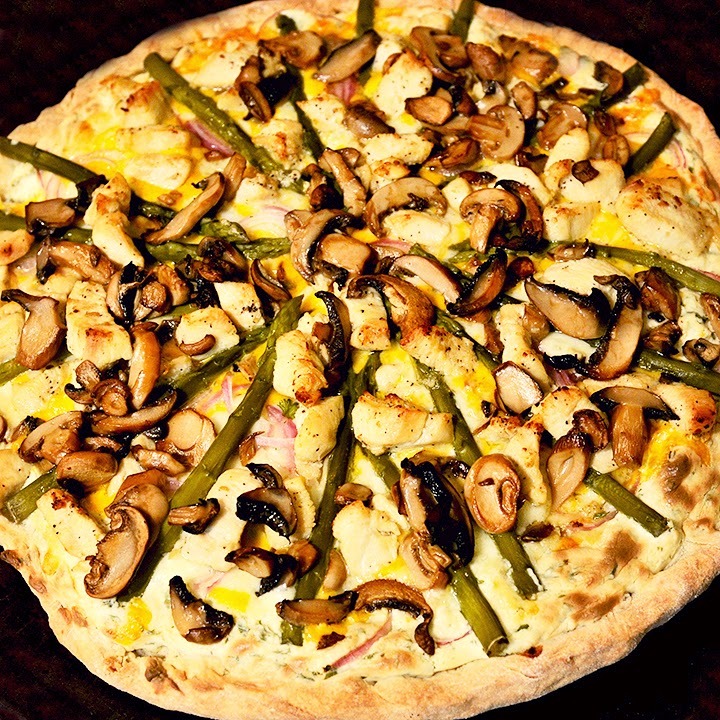 When I could eat real pizza, we would get ours from Papa Murphy's. 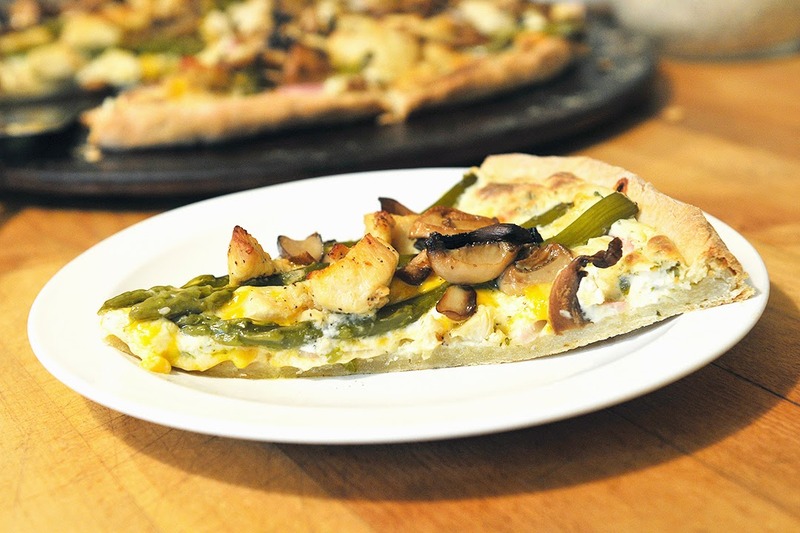 I love the creamy white sauce they use and the chicken /artichoke pizza was always my favorite. 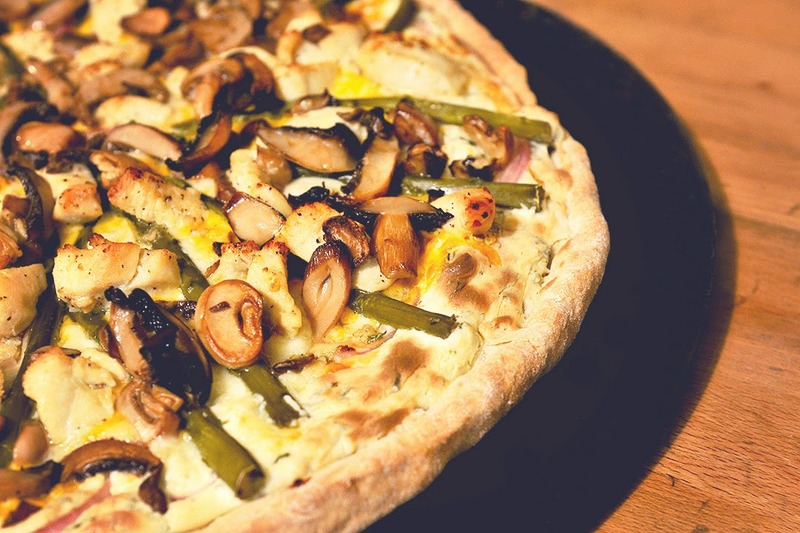 This pizza pie is similar to the flavors used on theirs. 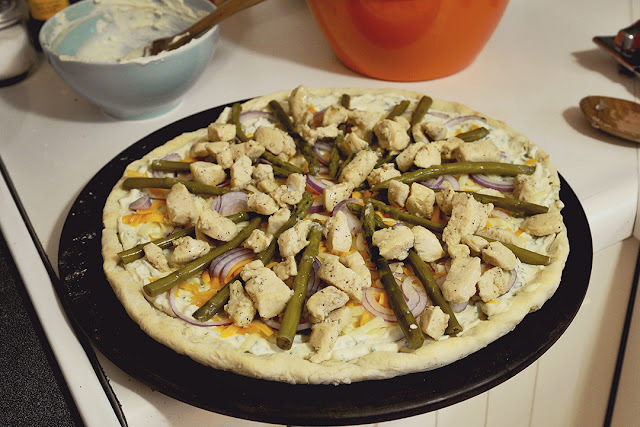 I get the chicken, slightly tanginess of the artichoke with asparagus and the creamy white sauce is replaced with the cream cheese topping. Sounds good, huh? 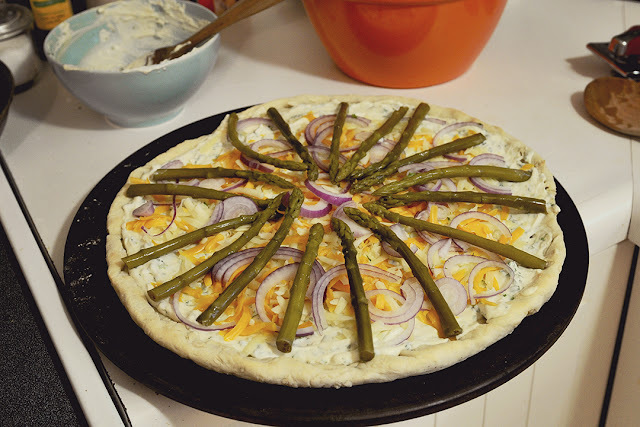 Asparagus on pizza? Why not! If you love it then you should use it..is my motto in the kitchen. I just started pulling things from the fridge and BAM....the Chicken Pizza Pie was created. This was loved by my whole family. They even asked for to be made again...now that is a winner in my eyes! And yes, I ate two small pieces...Bad girl! but sometimes I am willing to take the risk for something that is sooooo good. This was one of those times and the fall out was minor..thank goodness..LOL (Not eating wheat gets in my way soooo many times) I have yet to find a really good gluten free pie crust. If you have one, PLEASE send it my way! Double Pie Crust Dough-- I used the recipe from my meat pies found here. 20 asparagus spears, marinated is preferred. If using fresh, you will need to prepare as usual. Prepare you pie dough. Refrigerate for at least 30 minutes or longer. Mine was made the night before. Prepare you pan. 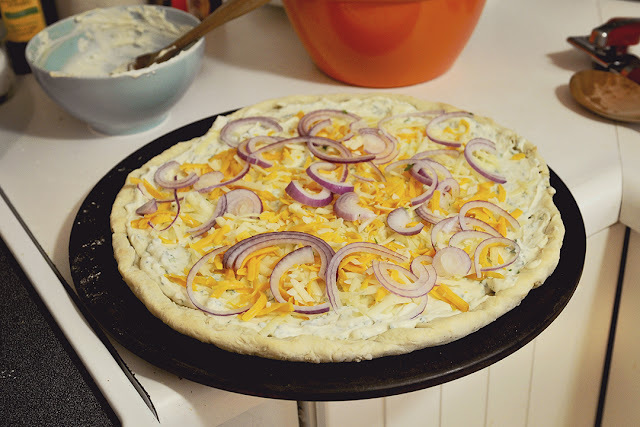 I use a pizza stone and so it is already seasoned and ready to go. You can also use a cookie sheet. If you do, then sprinkle some corn meal on the pan so the crust does not stick. Roll out your dough and precook it for 15 minutes. While crust is cooking, prepare you sauce. 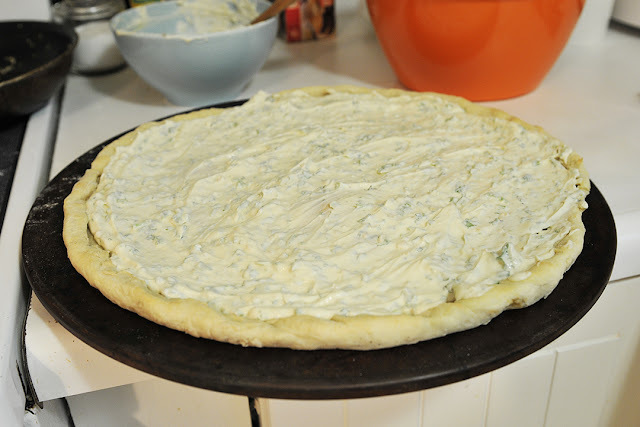 Combine cream cheese, fresh parsley, garlic and honey mustard. Set aside. Slice your onion. I sautéed my mushrooms in olive oil until they were brown. I let my marinated asparagus sit in a bath of water for 15 minutes. This will help to lose some of the brining. You still get the tartness but it will not be so overwhelming. I also do this with olives for some dishes. It helps a lot to regulate the flavors in some dishes. Cut your chicken into cubes and cook your chicken and minced garlic with the EVOO until golden brown and not pink. Shred your cheese. I use what I have in the fridge. In this case it was Jack and Cheddar. 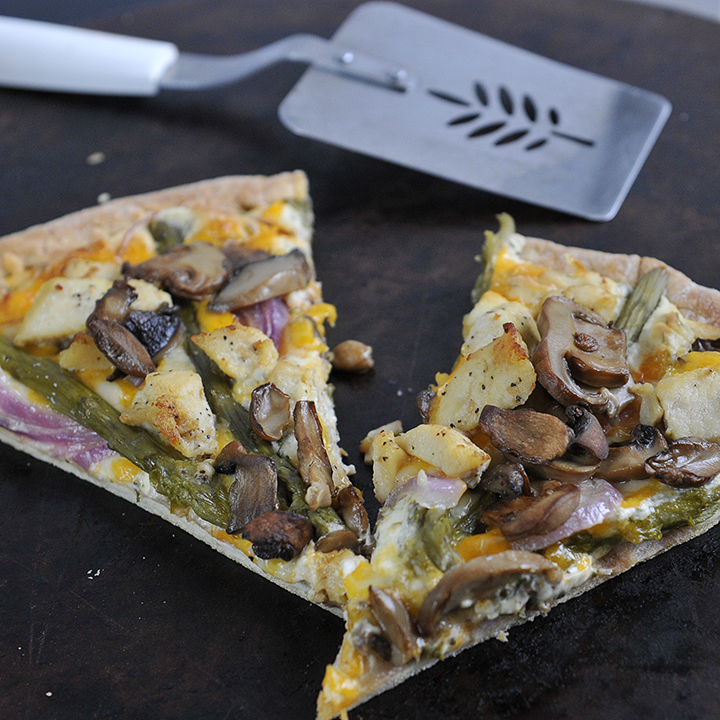 When everything is cooked, sliced, grated and pre-baked then you can build your pizza pie. Bake your pizza for 15-20 more minutes. The sauce will swell up and the cheese should be melted. The crust is golden brown. What a creative pizza! Gorgeous pics as always!